Please copy and paste ' [[Category:Barbs]] ' into the end of your article to include it in this category. Barbs are a very popular group of fish belonging to the large family of Cyprinidae. 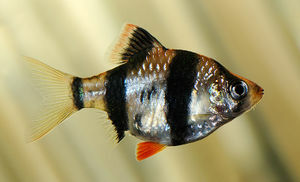 Barbs are generally found in the genus Barbus and Puntius, but other species may also be called "Barb". They are predominantly found in Southeast Asia and India and are often brightly coloured. This page was last edited on 26 August 2015, at 16:01.